The Art of Ancient Cyprus, pp. 254 and 263, pl. 287 (item one), p. 19, pl. 10b (item two), p. 73, pl. 129 (item three) and p. 65, pl. 97a (item four). Item one (horn-shaped vessel): cf. 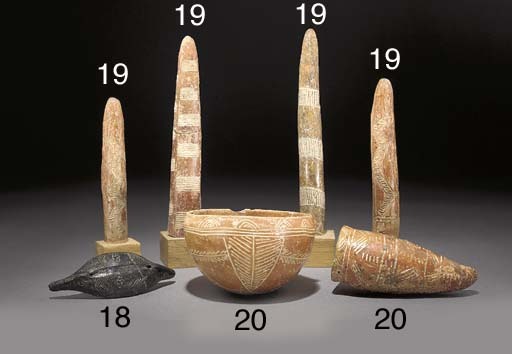 H. von Wilfried Seipel, The Collection of Cypriote Antiquities in the Kunsthistorisches Museum, Wien, 1999, p. 60, no. 6, for a close parallel. See illustration opposite and on previous page of the printed catalogue.